Rikalize Reinecke at work on her aquaponics farm. Note the different methods of plant propagation. 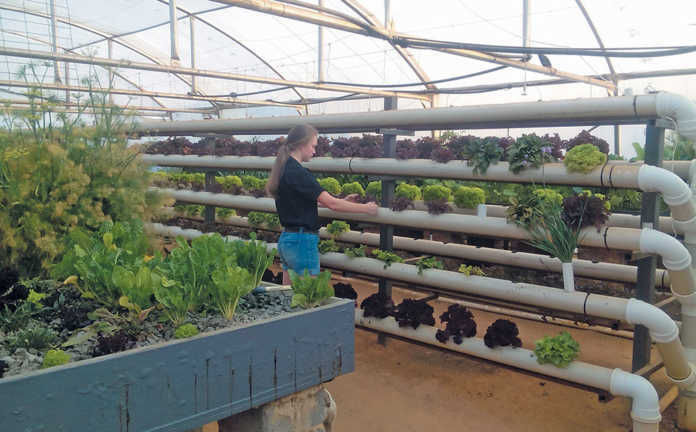 In 2012, when Rikalize Reinecke was only 12 years old, she persuaded her father to let her attend a training course in aquaponics. In due course, this led to the establishment of La Pieus Aquaponics near Roodeplaat, Pretoria. There are relatively few women in fish culture circles in South Africa, let alone teenagers. La Pieus has a number of tunnel systems and both fish and plants are grown and sold. Rikalize breeds a red strain of Mozambique tilapia (Oreochromis mossambicus), stocking round plastic and corrugated tanks with fingerlings and feeding them until they reach 400g. These are then sold to various outlets and restaurants in the local area. The actual fish production is relatively modest, as the main focus is on the plants, which use the fish waste as nutrients for growth. Rikalize grows lettuce, herbs, strawberries and vegetables without soil in two ways: in gravel beds, and with their roots suspended in the nutrient-rich water (see picture above). No pesticides or fertilisers are used, and the product is effectively organic. The nutrients circulate through the plant culture systems, which extract nitrates from the water in much the same way as a traditional bio-filter would. The gravel-filled tubs operate on a bell-siphon flow system that periodically fills and empties them, allowing for transfer of both nutrients and oxygen to the plant roots. Other plants are set in floating polystyrene rafts that float on the water with their roots extracting the nutrients. One of the disadvantages of a traditional aquaponics system is the cooling effect that water circulation has on water temperature. This slows down fish growth, as tilapia are tropical species that grow optimally at a constant temperature of about 28˚C. The problem is exacerbated by the already slow growth potential of O. mossambicus; this species takes 14 months to reach 500g, whereas Nile tilapia (O. niloticus) takes just nine months. For this reason, Rikalize is currently applying for a permit to use O. niloticus. She is also planning an improvement to the system on the farm: only the heavy sediment-laden water will be used for plant growing, while biological filtration will be installed for the fish-culture system. 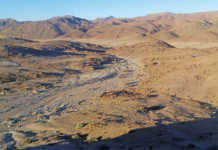 The water used for the fish will therefore not pass through the gravel beds. 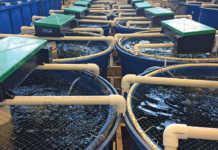 The nutrient-laden water, on the other hand, will then be circulated through the plant culture systems via a sump and header tank, but not returned to the fish. Rikalize’s father, Danie, specialises in electronic security systems as a profession, and all systems on the farm are monitored by CCTV, which connects to Rikalize’s cellphone. Thus, while away at school (she is a weekly boarder), she can keep track of all aspects of the system at any time and ensure that the pumps are running, the fish are being fed and all is well. There are not many young people who do that on their cellphones!